Mr & Mrs S bought a property with a large amount of land, they wanted to design and build a family home to a high standard and therefore the existing property was demolished and replaced with a 640m2 floor area property. 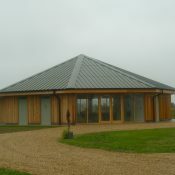 The property is in a rural setting which is off the gas grid, however they wished to create a modern and efficient feel to their new build home and they asked us to provide a heating and hot water system, the customer did not have a specific system in mind but was interested in installing a renewable heating system to reduce the long term fuel costs and reduce carbon emittance. The property would not always have full occupancy, therefore a system which did not require regular input to function was needed. We considered Biomass, Air Source heat pump, Ground Source heat pump and Solar. Biomass & Solar Thermal were discounted, after a site survey was carried out which found horizontal collectors not feasible due to poor ground conditions and the orientation of the house not suitable for Solar Thermal. An Air Source Heat Pump was not favoured by the customer and due to the space available a Ground Source Heat Pump with bore holes or an open loop system was explored. When the geology of the soil was checked in the area which would be used for ground collectors, it was found to be gravel. As gravel is a poor conductor of heat, we therefore recommended a bore hole system. With a 49,949kw heat load requirement, it was calculated that 4 bore holes of 120 metres depth were needed. The heat pump design considered was a 1345 30kw 3 phase heat pump with a 500L buffer and 500l of hot water. This system met all of the requirements but given the location of the property, the cost of getting 3 phase electricity was prohibitive. The old property which was demolished had 2 x 60 amp supplies, these were upgraded to 2 x 100 amp allowing the use of 1 x 100 amp for the house and 1 x 100 amp for the heat pump. We assessed the plant room size and needed 3 x 10kw S/P NIBE 1145 Ground Source Heat Pump with 1 x 500L Buffer and 1 x 500L cylinder. The only problem with this solution is that 1 Compressor would be worked more than the other two as only 1 can heat the water. 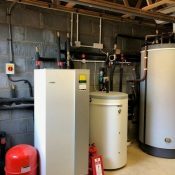 We approached NIBE to see if multiple 1245 had been installed before as these heat pumps have integrated hot water cylinders of 180 litres each. The report from NIBE was that in theory it was a possible but it was an untried solution. Software was available to enable a master and slave installation. We were confident in this design and solution and decided this was the best option for the customer and therefore went ahead with the first NIBE triple 1245 installation in the UK. Advantages of proceeding with this installation is that we now have 540 litres of hot water with very quick recovery time which is spread over all compressors available. The 3 compressors available are able to start independently to allow heating of the house to be modulated. We also recommended the NIBE uplink facility as this provides flexibility for our customer to be able to control the heating system whilst away from home. 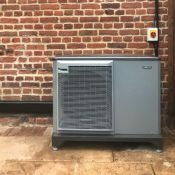 The heat pumps have weather compensation built in to ensure they adjust accordingly to the outside temperature to only produce the heat required. 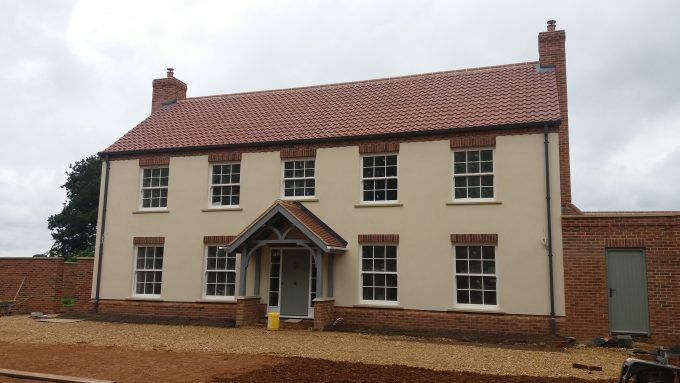 The property is fitted with three Zehnder Mechanical Ventilation Heat Recovery systems 2 x units 350 m3 per hour & 1 x unit 200 m3 per hour, with 6 manifolds and 37 MVHR grilles, providing a balanced ventilation system for the whole house and recovering 93% of the heat which would have been lost. Whilst installing the MVHR and due to the layout of the property, to comply with building regulations the property needed to have a protected fire corridor, therefore we worked with the builder on site and install fire dampers for the MVHR system to provide a fire corridor area and to overcome this problem. 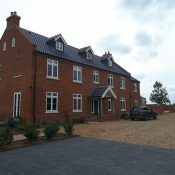 Mr & Mrs S were interested in making sure the look of the property was clean and modern, therefore they chose underfloor heating to be laid throughout the property as it is designed to work efficiently at lower temperatures. 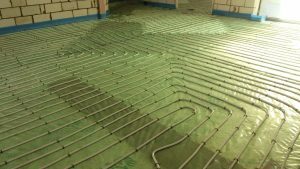 Underfloor heating, with 4500 meters of pipe was laid throughout the property over 3 levels of the house, an office and to the guest annexe all of which have been designed at 35° flow temperature and a 6* rating, which is the highest achievable. The Seasonal Coefficient of Performance (SCOP) is 4.6.